Seminal Jack Nicholson scene voted most frightening, but The Exorcist and A Nightmare on Elm Street have the edge overall. 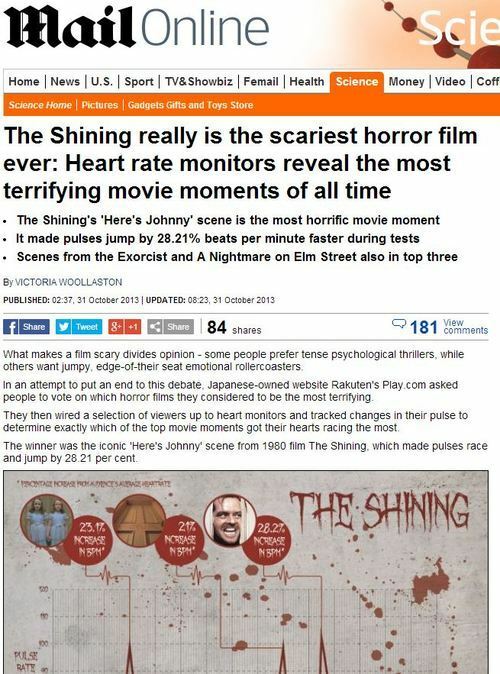 The “Here’s Johnny” scene from Stanley Kubrick’s The Shining is officially the scariest movie moment of all time, according to a new study. What makes a film scary divides opinion – some people prefer tense psychological thrillers, while others want jumpy, edge-of-their seat emotional rollercoasters. In an attempt to put an end to this debate, Japanese-owned website Rakuten’s Play.com asked people to vote on which horror films they considered to be the most terrifying. They then wired a selection of viewers up to heart monitors and tracked changes in their pulse to determine exactly which of the top movie moments got their hearts racing the most. 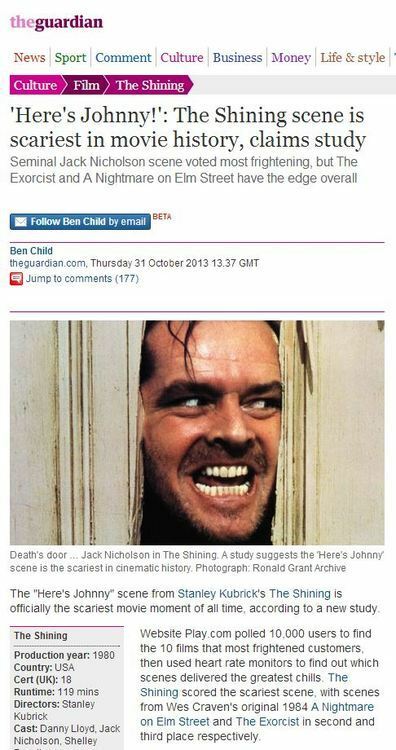 The winner was the iconic ‘Here’s Johnny’ scene from 1980 film The Shining, which made pulses race and jump by 28.21 per cent. It probably says a reasonable amount about the state of the British press that a story categorised by the Guardian in their ‘Culture: Film’ section is, in the Daily Mail, considered a ‘Science’ story. However, it’s not hard to see how the Daily Mail was confused – after all, the story talks about tracking heart rates and monitors. It certainly looks like science. But what was the source of the story? 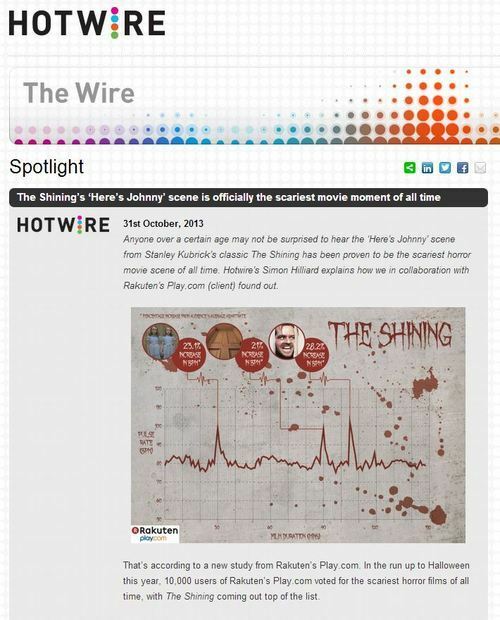 Website Play.com polled 10,000 users to find the 10 films that most frightened customers, then used heart rate monitors to find out which scenes delivered the greatest chills. Clearly this is nothing more than an movies-and-games website looking to secure a few headlines in the press, via their PR agency Hotwire PR. If you think the blog post Hotwire PR published recounting their work seemed to resemble the article in the Daily Mail closely, you should see the press release they sent out to journalists – from which almost all of the Daily Mail’s article was lifted wholesale. If any other journalists want to share with me the press releases they get sent by PR agencies, I’d happily take them off your hands. This entry was posted in Uncategorized and tagged ben child, daily mail, guardian, Hotwire PR, play.com, Shingo Murakami, Simon Hilliard, victoria woolaston on November 14, 2013 by Michael Marshall.